Easy payment with your Paypal account. Hosted by Paypal, but you don't need a Paypal account. Choose to pay by Credit Card from the Paypal login page. How can I make payments if I don't have a Paypal account? You can pay via credit card. Paypal provides the option of a secure payment service without having to have a Paypal account. When you select the "Download Now" button you will be taken to a secure payment screen where you can fill in your details and make your purchase. Due to the large file size, the Repair Manuals are in .ZIP PDF format. Once downloaded, you will require an unzip program (like Win Zip) to open the .ZIP folder. If you don't have a zip program on your computer, you can download a free version of Win Zip here. PLEASE take note of the location you are downloading the file to. Once downloaded, extract the file with WINZIP to a location of your choice. Once extracted you will have a PDF file for viewing and printing. PLEASE save the repair manual to your hard drive, memory stick or cd. 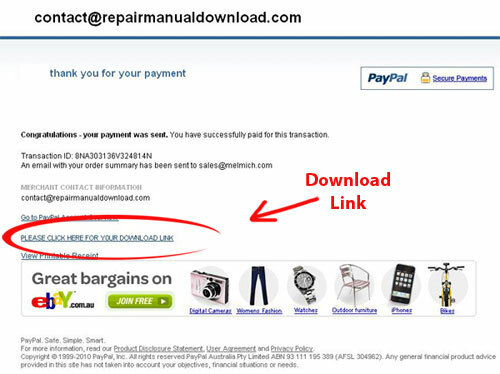 After paying for your manual (either by Paypal or Credit Card) you will be taken to a page that thanks you for your payment (see below). On this page look for the link that says "PLEASE CLICK HERE FOR YOUR DOWNLOAD LINK". If the above instructions are followed, there will not be a problem. If, however, you run into difficulty of any kind please contact us and we will send you an email with a fresh link. This has to be done manually and is usually done within 12 hours (often sooner - depending whether we are in bed or at the computer). Please include your purchase details (date item was paid for, email address used, receipt number) and what the problem is, ie closed window before clicking link, cannot open file etc.